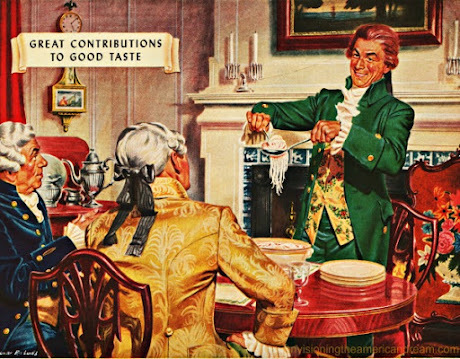 In honor of #NationalDrinkWineDay today, let's raise a glass or two to that fine-wine-and-mac-and-cheese-loving president, Thomas Jefferson, who claimed in 1818 that "in nothing have the habits of the palate more decisive influence than in our relish of wines." But Jefferson's own drinking habits were formed more than thirty years earlier while he was serving overseas as U.S. Minister to France. Before his journey to France in 1784, Jefferson, like most of his countrymen, had been a consumer of Madeira and port, with the occasional glass of "red wine." As he recalled in 1817, "[T]he taste of this country [was] artificially created by our long restraint under the English government to the strong wines of Portugal and Spain." The revolution in his own taste in wine followed swiftly on the breaking of the bonds of British colonial government. Thereafter Jefferson rejected the alcoholic wines favored by Englishmen as well as the toasts that customarily accompanied them. He chose to drink and serve the fine lighter wines of France and Italy, and hoped that his countrymen would follow his example. So Jefferson preferred to serve the fine, light wines of Italy and France to his many dinner guests at the President's House. It has also been said that he first served Macaroni and Cheese there in 1802. Of course, the dish that he served was nothing like the boxed versions that we're so familiar with today. Using pasta and parmesan cheese imported from Italy, Jefferson’s chefs cooked the macaroni until it was soft, then coated it with butter and added cheese. The mixture was then placed in a casserole dish, probably dotted with a bit more fresh butter and cheese, and baked until it was slightly brown with some golden crustiness on top. Preheat the oven to 450°F. Butter a 13 by 9-inch glass baking dish and set aside. In a large pot of boiling water, cook the noodles until tender, about 8-10 minutes. Drain, but do not rinse. In a large bowl, whisk the milk, flour, salt and pepper until blended. Stir in 1 ½ cup Parmesan, 1 ½ cup mozzarella and 1 ½ cup Romano cheese. Add the noodles and butter and toss to coat. Transfer the noodle mixture to the prepared baking dish. Sprinkle the remaining Parmesan, mozzarella and Romano cheese over the noodle mixture. Bake until the cheese begins to lightly brown on top, about 12-14 minutes. Let stand for 10 minutes before serving. Season with salt and pepper to taste and enjoy!